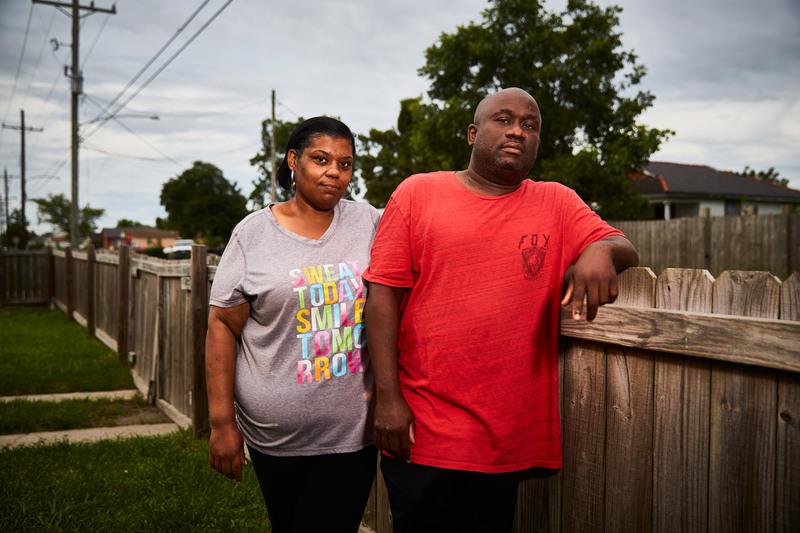 Anitra and Jerome Taylor stand for a portrait in their front yard on Dale Street in a New Orleans neighborhood known as the Goose, where they grew up. They moved to a supposedly nicer neighborhood and were robbed seven times there, so they moved back seven years ago. Both are concerned by an uptick in violence since the start of the year. "The most hurtful thing is that the people making the two blocks dangerous don't even live here," Anitra says, echoing many residents' sentiment that crime is imported to the Goose. When guests come to visit, she escorts them from their car to her house. "That's embarassing," she says. She and Jerome, 43, keep up their home as an example to others. Anitra, a community college student, hands out popsicles. Jerome talks to every passing youngster "to let them know I care," as his childhood neighbors did. Asked if the violence has shaken her faith Anitra offers no hesitation; "I've lost my faith in man, but no, I've never lost faith in God," she says. "My faith in God makes me care."